Compound Steam Engine is the oldest form of obtaining power in the engineering sector. A compound steam engine has more advantages than a simple steam engine. Hence According to an expansion of steam, the engines are classified as a simple steam engine, compound or multi-expansion steam engines. 01) Lightweight cylinders are required in a compound steam engine. 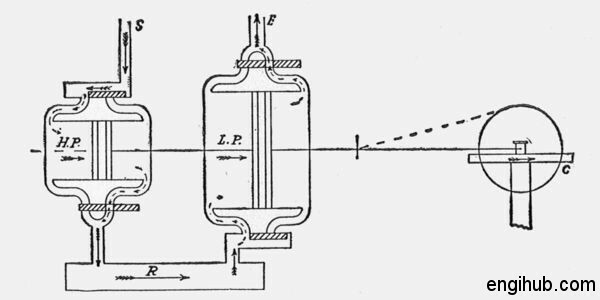 The cylinder in a simple steam engine is required to make strong and large enough to withstand the high-pressure steam and to accommodate the large volume of low-pressure steam respectively for the same expansion ratio comparing to compound steam engine. Compound engines are light in weight as the high-pressure cylinder only subjected to maximum pressure, but its diameter is small and a low-pressure cylinder is large in size but light in weight. 02) Temperature Range means the difference between the highest and lowest temperatures of steam within the cylinders and this range in each cylinder is reduced, with a corresponding reduction in initial cylinder condensation and temperature stresses. 03) In the case of breakdown, the engine can be run on a reduced load by using only one cylinder. This feature gives great advantages, especially in marine propulsion. 04) A lighter flywheel can be used in modern compound engines because of lower variation of turning moment as the cranks are at 90 degrees to each other. This results in better mechanical balance, which allows the higher speed of the engine. 05) After expansion in the high-pressure cylinder, the steam can be reheated before admission to the low-pressure cylinder. 06) Because of the reduced pressure difference in each cylinder, the leakage of steam past the pistons and valves are reduced. 07) There are fewer forces acting on the working parts as the forces are distributed over more components of the engine. 08) The compound steam engine may start in any position which is an advantage for locomotive and marine engines. 09) As there are two or more cylinders and pistons in a compound steam engine the stroke length of each cylinder is comparatively less than a simple steam engine. 10) For the same horsepower, the cost of the compound steam engine is less than simple steam engine because of lighter parts used in this type of engine.